26 Gorgeous Hikes on the Western Côte d'Azur is an illustrated guide that invites you to slow down to the rhythm of your footsteps, and soak in the Western French Riviera's natural beauty. With detailed trail descriptions, hiking maps, hiking data such as time, distance, difficulty and elevation profiles for twenty-six hikes, the guide shows you where to: Stroll along the coast and reach inlets otherwise only accessible by boat. Hike up red mountain peaks and embrace the views of the Mediterranean Sea. Climb up a bluff and discover the resting site of ancient millstones. Enjoy a walk by chestnut groves and watch a monastery set aglow in the setting sun.Explore this magical region in a sensitive, ecologically responsible way.Illustrated with over 50 photographs, the scenic hikes range from one-hour strolls to half-day treks. 26 Gorgeous Hikes on the Western Côte d'Azur appeals to active travelers who long to explore France's Côte d'Azur on foot and off-the-beaten-path. It describes half-day hikes by the coast, through forests of chestnut trees and cork oaks, over hills of red volcanic rocks. Color photos and maps illustrate each hike. 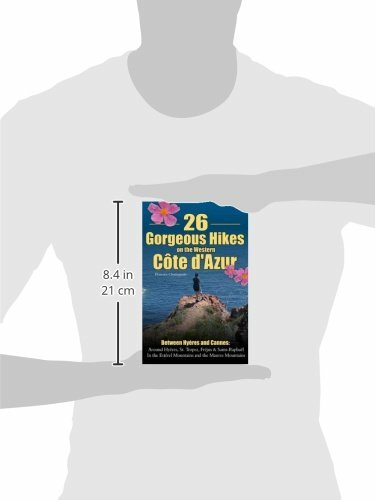 The book not only describes hikes, but engages readers with information on local geology, flora, fauna and human history.Close to 10 million people visit the Côte d'Azur or French Riviera every year. According to a study commissioned in 2002 by the World Tourism Association, 25% of visitors to France mentioned they would love to explore the countryside on short discovery hikes during their vacation.26 Gorgeous Hikes on the Western Côte d'Azur offers the insights of Florence Chatzigianis, a long-time hiker who has spent many months over the last ten years scouting southern France's footpaths for hikes with panoramic views over the Mediterranean, hikes that lead to inlets otherwise only accessible by boat, hikes to prehistoric sites that rarely see a visitor.